First was the Microsoft Xbox. A few hacks and modifications later, it became a full-fledged multimedia center. During my recent trip to Manila, I came back with a Magic Sing karaoke system. You gotta give it to those Koreans. Literally thousands of songs (actually MIDIs) built right into the microphone. When my sisters came back from Manila, they brought with them an MP4 player with karaoke functions. Works quite well with the MP4 DVDs I brought before. Chalk one up for good compression codecs - thousands of minus-one videos on one DVD. Our latest acquisition? 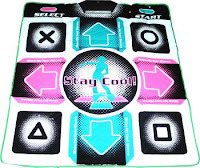 A Dance Dance Revolution (DDR) PC game complete with a Topway dance pad. Sure brings back memories of weekends at the arcade (watching, not dancing).